When Dr. Drew Ramsey, clinical psychiatrist and Columbia University professor, bought a small farm in rural Indiana, he learned more about food than just how to grow a tomato (albeit, he grows one fine tomato!). He learned that putting our hands in the soil is therapeutic, that there is nothing like picking ingredients from your garden and assembling a meal for your family, and much more. 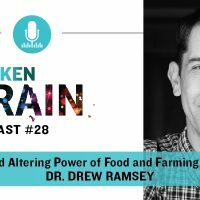 Today, in our Broken Brain Podcast, Dhru talks with Broken Brain docu-series expert speaker and kale evangelist, Dr. Drew Ramsey. Dr. Ramsey integrates nutrition into his clinical psychiatry practice as an important component of treatment. Dhru and Dr. Ramsey discuss the need to put brain health and psychiatry into the vocabulary of our daily lives, the many benefits of growing your own food, nourishing our minds with community engagement, and much more. You’ll even get to hear Dr. Ramsey’s favorite kale recipe that anyone can make easily. PS – Find Dr. Ramsey online here, on Instagram, Facebook, or Twitter. Read more about his Eat to Beat Depression online course and his latest book Eat Complete. Finally, here is Dr. Ramsey’s newly published paper on antidepressant foods.